Experience the “Magic of Harmonics” – Riding the Wave of Sound! 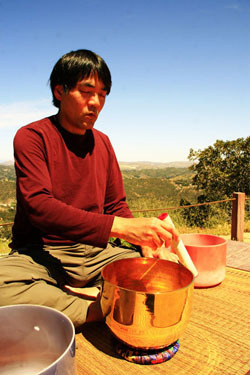 Using the ancient vocal techniques of overtone singing combined with the beautiful and ethereal tones of crystal singing bowls, a “Magic of Harmonics” event is a sonic experience that raises the consciousness and energy level of everyone present. When focused with power and mindful intention, sound can be a direct path to help balance and integrate body and mind through the vibratory alignment and resonance that is created. It can serve as a pathway to explore dimensions of unlimited creativity, vocal power, and inner wisdom. Through resonance and vibration, the wave forms and harmonics created by the crystal singing bowls and vocal overtones helps to return us to a state of our natural rhythm and frequency. To help heal the Earth. It’s an incredible experience to play the crystal singing bowls and to sing beneath the trees. The sound of the wind, the singing of birds, the swaying of trees all seemed to merge into one Dance of Creation. Beautiful vibrations, harmonious sounds…all seemed to be as food for Mother Earth! Overtone Singing (also known as throat singing), is the use of our vocal apparatus to sing two, three, or more notes at the same time. The sound is quite ethereal and can be a way to help balance out the energies in the body and to calm the mind. “Very wonderful experience. The most relaxed I’ve been in weeks! Thanks David! I appreciate your kind thoughts!